Dr. Tom opened East Hilliard Veterinary Services along with his wife Dr. Sue Klein, in 1987. Dr. Tom primarily sees advanced and routine dentistry cases from the local area and surrounding states. His patients range from dogs, cats, and rabbits to wallabies, polar bears, giant cats, apes, and various other animals. He has a passion for teaching dentistry as well as practicing, and allows OSU veterinary students to participate in an externship program with him during their final year. Along with Dentistry he also sees small animals, birds, and other exotics for routine care. Prior to making Hilliard his home, Dr. Tom received his DVM from Michigan State University, in 1983. After graduation He married his partner at home and work, Dr. Sue, and moved to Lancaster, PA. While there he worked in a large animal practice for 4 years. When Dr. Tom is not working he enjoys gardening, training for and participating in triathlons and marathons. Dr. Sue opened East Hilliard Veterinary Services along with her husband Dr. Tom Klein in 1987. Dr. Sue has a passion for dermatology, nutrition, and behavior. She works hand in hand with specialists in the area, to make sure that all of her clients are as healthy, physically and mentally, as possible. Along with her more advanced cases, Dr. Sue also sees dogs and cats for routine and sick care. She is also involved in managing the business side of the practice. Before calling Hilliard her home Dr. Sue received her DVM from Michigan State University in 1983. After graduation she married her partner at home and work, Dr. Tom, and moved to Lancaster, PA. While there she worked in a small animal practice for 4 years. When Dr. Sue is not busy helping her clients she enjoys attending country music concerts, baking for the staff and having them taste new recipes. Dr. Chris has been at part of the East Hilliard Veterinary Services family since 1997 after graduation from The Ohio State University College of Veterinary Science. Dr. Chris has a soft spot in her heart for all of her patients and sees our largest patients, our goofy gentle giants, to our smallest patients, the tiniest mouse. She has a passion for soft tissue surgery and wellness care. Her and her husband, Paul, live in Hilliard with their two children, Nicholas and Emily. In addition to her two human children, Dr. Chris has three cats, Ruby, the matriarch of the family and Loki and Peter, the newest balls of energy. She also has a hamster, Henry. When not at work she actively volunteers at her children’s schools, scout troops, and church functions. She enjoys spending time with friends and family. 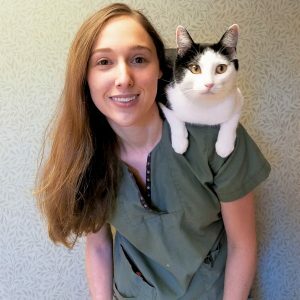 Dr. Janelle joined East Hilliard Veterinary Services as a doctor in February 2017. She is a 2016 graduated of The Ohio State University College of Veterinary Medicine. 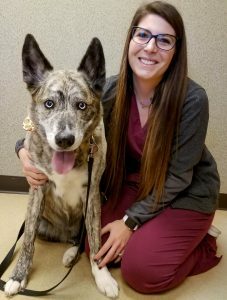 Prior to joining our staff as a doctor, Dr. Janelle also worked here for 3 years during veterinary school helping assist and learning from all the doctors and staff. Although small in stature, Dr. Janelle likes working with dogs and cats of all shapes and sizes. She particularly enjoys providing routine wellness care as well as management of allergy, orthopedic, and internal medicine cases. When not working, Dr. Janelle and her husband, Tony, enjoy traveling to visit family in other states as well as exploring new countries. She also enjoys spending time being active and running, as well as relaxing and reading a good book. 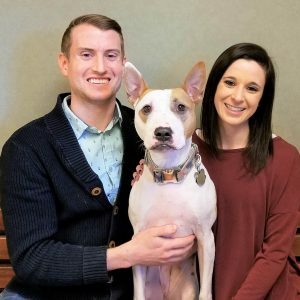 She has one very spoiled Pitbull-Basenji mix named Cinci, who was found in Cincinnati and made her way to Columbus where she was rescued by Dr. Janelle and her husband. 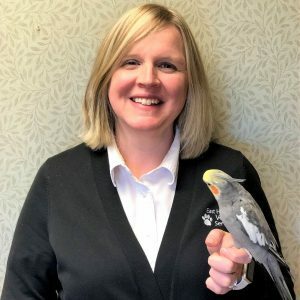 Kelly graduated with an associates degree in accounting and worked as a full-time bookkeeper for 26 years until she became employed at East Hilliard Veterinary Services, where she enjoys interacting with people and their pets. Kelly has a son in college and very active in hockey and a daughter that is entering college and loves to ride her horse. Kelly has many family pets. She has two dogs, two cats, two parrots, one rabbit, one hedgehog, one duck and one miniature pig, all which live under one roof. She also has two horses and one miniature horse that live at her barn. In her spare time, Kelly enjoys spending time at her barn and loving on her two legged and four legged children. Sam is originally from Canton, OH but grew up in Texas. While in Texas she became a certified yoga teacher through the Living Yoga Program in Austin, TX. Sam enjoys sharing her love with furry friends and their owners as well as learning the science behind the scenes. Growing up in the piney woods of East Texas, Sam has been a lifetime animal lover of all kinds, although she currently only has her baby girl Gizmo. Gizmo is a collie mix from a long line of dogs that have been in Sam’s family for 20 years. Outside of work she and Gizmo love all things water related: swimming, kayaking, finding hidden waterfalls, hiking, camping, yoga, playing sports and relaxation time. Ann grew up in Columbus and graduated from the University of Dayton, where she earned a BA in English with a minor in music/voice. She has a special interest in international wildlife conservation, and worked for nine and a half years at the Columbus Zoo and Aquarium. You may have seen her on a few zoo commercials over the years! Ann loves dogs of all kinds and has a wonderful, graceful and gentle guardian Miss “Walle Lilly Fluffy Woof,” as her son calls her, the great pyrenees. She enjoys acting, singing, guitar, watching sports (Go Bucks! ), and travel. But most of all, she enjoys spending time with her husband Derek and their children, Ryan and Nora. Lydia, RVT, graduated from Bradford Schools with an Associates of Applied Science in Veterinary Technology. Lydia has a passion for rehabilitation , holistic medicine, and dentistry. Although Lydia doesn’t have any pets of her own she considers all of our clients to be her fur babies and is sure to give them lots of extra love while they are here. When not at work, Lydia enjoys dancing, raising awareness for local charities, spending time with her husband, Brandon, and creating crafty works of art for her home and the clinic. Dominique, RVT, graduated from Columbus State Community College with an Associate of Applied Science in Veterinary Technology. As a recent graduate, Dominique loves continuing to learn about different areas of veterinary medicine, especially behavior and dentistry. When at home, Dominique spends time training, playing with, and napping with her dog Duncan. She also loves reading, sewing, carving wood, and browsing the internet for more puppy sweaters. 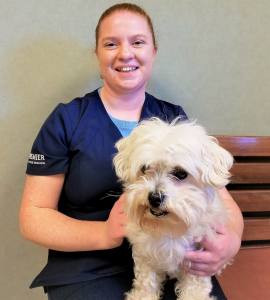 Tess, RVT, graduated from Columbus State Community College with an Associate of Applied Science in Veterinary Technology. She is pleased to have recently joined the family at East Hilliard Veterinary Services. Although she is eager to explore different areas of medicine, her main interests are with dentistry and behavior. Tess has lived in Hilliard her entire life, and is happy to work in the community that she loves. When not at work, she likes to spend her time hiking, kayaking, and traveling. She also loves to spend time with her two extremely spoiled dogs. She has a husky-shepherd mix, named Sakari, who she rescued a few years ago. As well as, LuLu, her goofy Olde English Bulldog. Sierra, RVT, graduated from Columbus State Community College with an Associate of Applied Science in Veterinary Technology. 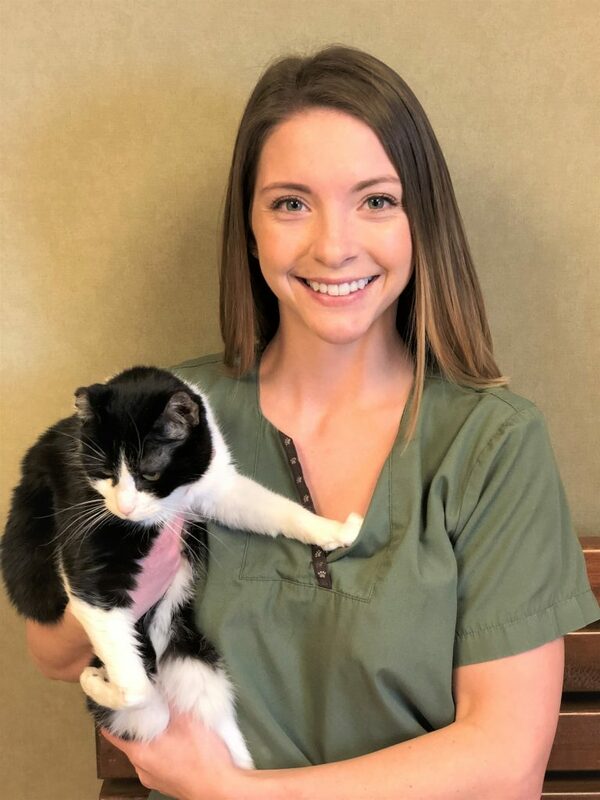 She is excited to be a part of our team here at East Hilliard Veterinary Services and has a special interest in both dentistry and behavior. She likes to make sure clients and patients feel welcome and safe in the clinical environment. When not at work she enjoys spoiling her two cats, Berlioz and Bailey, and taking her Australian Shepherd, Duchess, for runs out in the country. Lindie grew up and lives in Pickerington, Ohio. She graduated from The Ohio State University with her B.S. in Animal Science in 2014.She is currently attending The Ohio State University College of Veterinary Medicine and will graduate in 2020. She has an interest in mixed animalpractice and clinic ownership after graduation. Lindie enjoys spending time with her dog, Cassie, and going for trail rides with her sweet horse, Oz. In her free time she enjoys taking dance lessons, reading, watching Buckeye football, and attending country music concerts. Ryan grew up in Brunswick, OH. He graduated from Georgetown University in 2015 with a BA in biology and continued his education at Case Western Reserve University for a post-baccalaureate career in chemistry. He is currently attending The Ohio State University College of Veterinary Medicine and will graduate with his DVM in 2021. 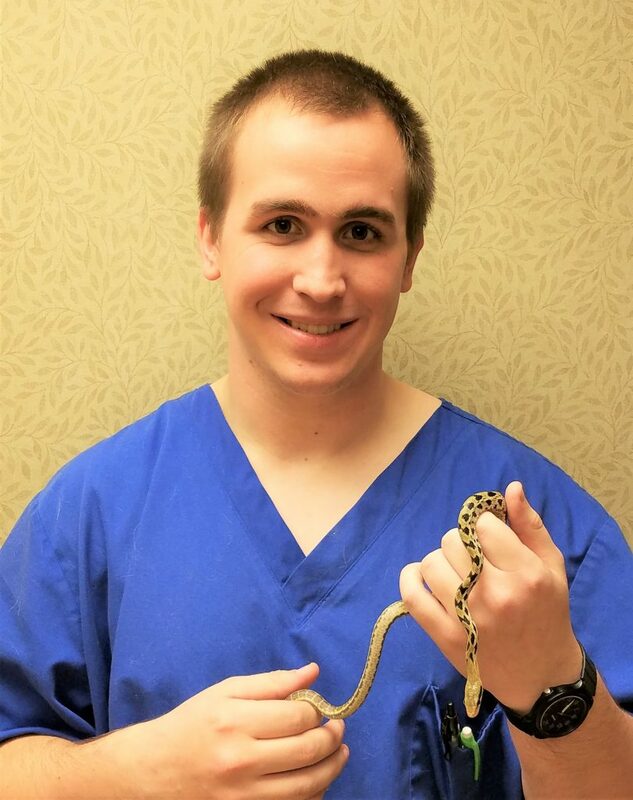 Ryan has interests within veterinary medicine including exotic medicine, in particular reptiles, orthopedics, and small animal medicine. Ryan’s hobbies include breeding pythons, fishing, and weight lifting. Mark grew up in Livonia, MI. He graduated from The University of Michigan in 2018 with a BS with Honors in Biochemistry and Latin. He has also published papers in insulin catheter design and pediatric surgery with the Extracorporeal Life Support Research Laboratory at Michigan Medicine. He is currently attending The Ohio State University College of Veterinary Medicine and will graduate with his DVM in 2022. 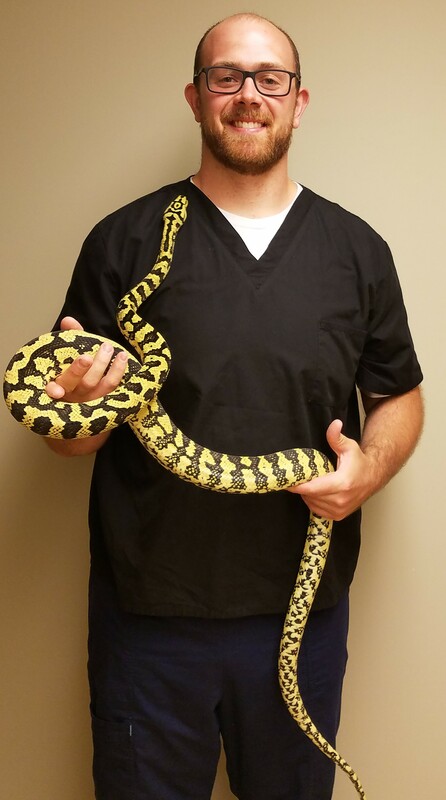 Mark has an interest in zoo medicine, especially avian, aquatic, and reptile medicine, animal husbandry, and zoo animal welfare. In his free time, Mark designs reptile enclosures, plays blues guitar, and reads.